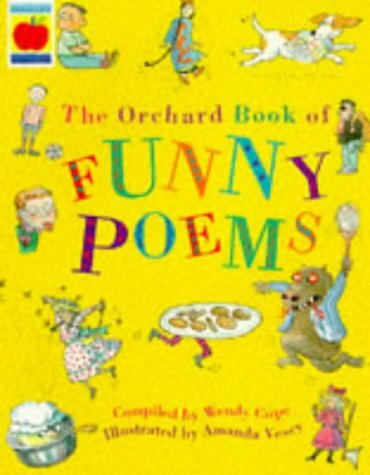 Eighty pages of the funniest poems that I have ever encountered including some that I wish I had met before and been able to share with particular children ..! Wendy Cope's selection is truly catholic, featuring the work of poets from different cultural backgrounds, from different eras and with very differing styles. Rarely have I ever been so comfortable with an anthology of 'funny' poems; not once was I irritated by the juxtaposition of poems or poets, or by gaping holes that one knows should have been filled by this or that poem. Wendy Cope has balanced the collection admirably, both in terms of pace and mood and in terms of poetic style. The whole is given continuity and made even more accessible for children by Amanda Vesey's catchy illustrations. This is a book for every infant and junior book collection and one that will help to put poetry where it should be - on the tongues of all children.